Three buddhist chants, occurring simultaneously. This recording was taken standing in the main courtyard of the "Sound of Thunder" monastery complex in Dunhaung, China. On my left, 20 meters away, was a temple of female monks chanting, with the leader amplified. In front of me, about 50 meters away was a smaller temple of female monks chanting, un-amplified. To the right, 35 meters away, was a small group of male monks reciting a chant and playing percussion before raising a banner. At one moment, behind a parked car a large collection of fireworks was set off (accidentally?). I turned suddenly to face away from it, and try to avoid overblowing the signal. Equipment: AudioTechnica Bp4025 Zoom H4N Post production: compression and equalization. 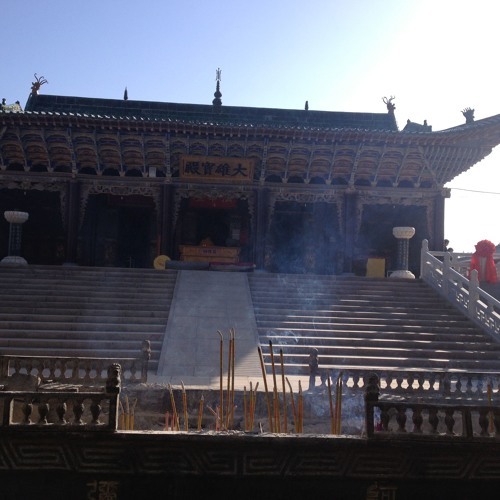 Recorded on Sept. 23, 2013 at the 雷音寺 (Sound of Thunder) Buddhist Temple, Dunhaung, Gansu, China.